The United States Postal Service uses all major carriers to deliver their mail across the United States and to other countries. 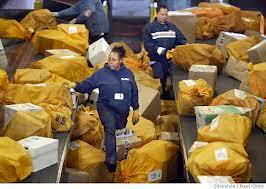 The mail has priority over the airline’s cargo, but not the passengers’ bags. When I was with American, after the plane landed, the airline had one hour to get the mail to the US or international postal area at the airport or face a fine. As I’ve said, American was growing faster than anyone could keep up, and mail would get left out in the rain, sometimes for hours. American lost the mail contract a few times. Also, as I explain in the book, bad employees steal high value mail — things like watches and cameras and other items that are insured. I helped the postal inspector catch perpetrators and suggested better safeguards, and the situation is improved. But there’s still a problem with regular mail. People frequently send cash in letters to their families in poor countries and vice versa. The bad employees actually feel the envelopes, looking for cash, and then hold them up to the sunlight or the light in the belly of the plane to try to see the money. When they find it, they steal it. So, don’t think you can send cash and get away with it. The truth is, you probably can’t. Someone is out there, just waiting for your fat envelope.